Topics: Brother, Canon, Epson, Lexmark, Muut Tulostinmerkit, and Valokuvapaperit. 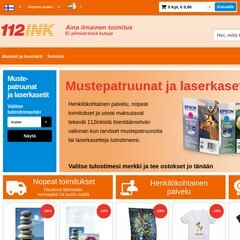 112ink.fi LEXMARK Mustepatruunat / Värikasetit - 112Ink.fi - muste .. The estimated 164 daily visitors, each view 3.30 pages on average. The programming language environment is PHP/5.1.6. Its 3 nameservers are ns.levonline.com, ns3.levonline.com, and ns2.levonline.com. Levonline Ab Stockholm is the location of the Apache/2 server. PING www. (217.70.33.46) 56(84) bytes of data. Website load time is 335 milliseconds, slower than 97% of other measured websites. As well, a ping to the server is timed at 131 ms.